Imagine waking up tomorrow, taking your usually Saturday stroll down to Safeway, and facing the horrible realization that the comfortable grocery store world of “excess” you have lived in all your life no longer exists. The shelves are empty; the freezers are thawed; the food is gone. Granted, this scenario sounds a bit drastic–perhaps something from a vision of a post apocalyptic, dystopian world. Fortunately for you, the odds are in your favor and you won’t witness this catastrophe in your lifetime (unless, of course, the Mayans really have predicted our fate, but that’s a story for another day). While you may believe that since we aren’t planning on an apocalypse anytime soon, those pre-planning pre-packaging pre-stressing domestic divas are overreacting by emptying the shelves of cereal, rice, and beans. But are they really? Food storage proffers many advantages to families in our day. Not only can food storage come in handy during emergency situations, it can actually save on grocery bills, help maintain a healthy diet for your family, and reduce waste. Along with having food storage in case of emergency, develop a plan to go along with it. While actually sitting down and writing out a plan seems a little pedantic, it is also an essential part of the process. Know what you’ve got in your inventory, make sure your supply is nutritious and could sustain your family for a set amount of time, and be certain to organize accordingly so that the food does not spoil. Another way food storage benefits families is by saving on grocery bills. You’re thinking “how on earth could buying an immense amount of food I don’t plan to eat save me money?” right? Granted, that is a logical question. However, buying in bulk at stores such as Costco or Sam’s Club generally saves money and is a good way to fill your cupboards for everyday use, along with putting some away for food storage. You may not need twenty loaves of bread or fifty pounds of beef, but you can at least freeze items like that and rotate them through. It’s all too easy to allow your family to run on quick and easy junk food that contains empty calories and zero nutritional benefits. Generally, these types of food are cheap and quick to make—perfect for any weeknight meal. However, when you buy in bulk and actually think through the items you are buying for food storage, you may find yourself making healthier choices for your family. Items such as whole grain rice, beans, and grains have a long shelf life and are packed with nutritional supplements. Pack your food storage with healthy, natural foods and rotate them through regularly to maintain your family’s health and appetite. Food storage also reduces waste in households. Freezing portions of the foods you normally buy in bulk helps reduce waste by lengthening the shelf life of foods such as bread, cheese, and meat. Managing your food in a purposeful way prevents the dreaded day when you dig to the bottom of your refrigerator drawer and retrieve unidentifiable items in the depths of mold and mess. Storing food in airtight containers and only using the needed amounts to prepare meals reduces waste significantly. Ultimately, the benefits of food storage outweigh the hassle of buying in bulk, rotating foods, and developing a plan. 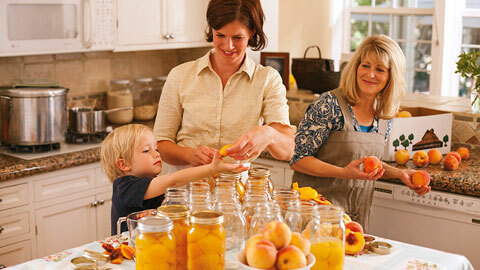 When food storage becomes a habit, it becomes an integral part of a family’s living environment. Food storage saves time and money, reduces waste, and becomes one less thing to worry about in an emergency situation.